Some people naturally seek to remove the burdens and stresses from those around them. Instead of being the person who creates burden, they often want to take this onto their own shoulders. While this can be a heavy weight to bare, these types of people simply want to make others happy and comfortable around them. 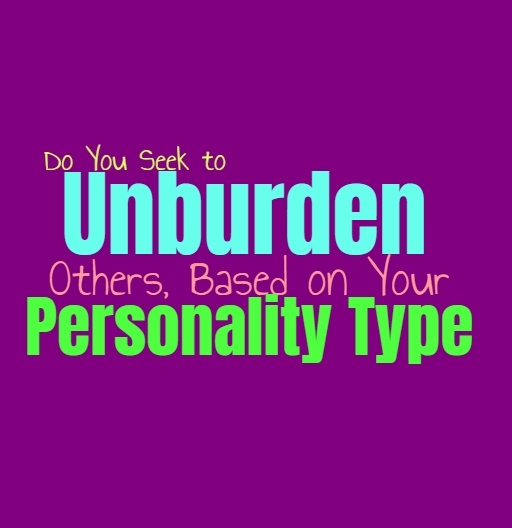 Here is whether or not you seek to unburden others, based on your personality type. INFJs definitely seek to unburden others since they don’t like seeing people they love in pain. For the INFJ finding ways to remove the burden from others makes them feel accomplished. They often hide their own pain and discomfort because they don’t want to be the person burdening others with these feelings. This can be difficult for the INFJ after a while though, since they find themselves bottling up their own feelings to prevent from hurting others or making people feel weighed down by their presence. ENFJs don’t like to burden people around them, instead they seek to lift their burdens. ENFJs often take on a lot themselves wanting to make others happy and more comfortable. For the ENFJ removing the burdens from others makes them feel accomplished and like they are important and valuable to those around them. Knowing that they are the person who provides for their loved ones and seeks to make their lives easier, makes the ENFJ feel like they are doing something worthwhile. INFPs don’t really seek to unburden people, since they can have a much more independent mindset when it comes to these things. They want to make their loved ones happy and don’t like the idea of hurting them, but they also don’t like the idea of trying to control them. INFPs express their feelings openly, even if this can sometimes burden the people around them. They don’t want to keep these things locked inside and often feel unhappy and trapped if they do. For the INFP it is just about being sincere, and they want others to do this as well. ENFPs don’t really seek to unburden people in the way others might understand, instead they just want to be there for them. Their sense of loyalty and their ability to listen, is what the ENFPs feels helps them remove these burdens. They don’t seek to take control of the situation and take on these burdens when they have not been asked to do so. They believe in giving people space and independence and dislike the idea of stepping in where they aren’t requested. INTJs don’t really seek to unburden others because they are more focused on handling their own business. They don’t go around wanting to remove the burdens from people’s lives, this doesn’t really make logical sense to them. INTJs are more than willing to help people out when they ask for it, especially when it comes to giving them information to fix the problems. INTJs don’t believe in trying to solve people’s problems or unburden them without being asked for help, even then they don’t want to just step in take care of everything without helping that person learn from the experience. ENTJs don’t seek to unburden people for no reason at all, but they do believe in providing for their family. When the ENTJ has a close circle they do want to provide for their practical needs as much as they can. They often measure their success by their ability to be the leader and be the ones in the position to do this. They care about their loved ones, but when it comes to unburdening people with emotional issues it isn’t something the ENTJ is focused on doing. INTPs don’t really seek to unburden people, since they are more independent minded than that. While INTPs are often open to hearing someone out and being there for them, they don’t like stepping in unless they are asked to. For the INTP it seems invasive and rude to try to force their help on someone, and so they rarely seek to unburden people unless they are directly requested. INTPs focus on their own inner thoughts and would rather have space from those around them. While ENTPs certainly care about their loved ones, they don’t like stepping in and unburdening them without being asked to. For the ENTP it is better to focus on their own problems and burdens, rather than going around trying to lift the burdens from everyone they know. This often seems a bit controlling and invasive and just isn’t how the ENTP naturally operates. They don’t mind helping out, they just would rather do this when it seems appropriate and not as a constant thing. ISTJs do want to unburden their family and loved ones, but only when it comes to practical needs. They work hard to be able to provide for them and often feel like this is their duty in some ways. While ISTJs care about removing certain burdens from those they care for, they don’t really find it is their duty to care for their emotional burdens. Mostly because it becomes challenging for them to do this or know how to respond, so ISTJs focus more on solving problems and finding practical means of helping. ESTJs do want to unburden their loved ones when it comes to practical and financial needs. They don’t however, find it natural to try and remove emotional stress or burdens. This is because ESTJs don’t really know how to solve these problems and so it becomes something they don’t seek to aid with. They care about their loved ones and so being able to provide for them and their practical needs is often how they want to unburden these people. ISFJs definitely seek to unburden their loved ones and naturally want to provide for them. They care about making the lives of others more comfortable and happy. ISFJs dislike seeing anyone upset around them and so they often seek to lift their burdens so that they can be more at peace. For the ISFJ this can become something which overwhelms them since they find themselves constantly trying to help others and rarely having time to express their own needs. ESFJs care about their loved ones and want to do whatever they can to unburden them. They often actively seek out ways to lift the burdens from the people in their lives. ESFJs dislike seeking anyone they love in pain, and so they want to try and make their lives easier when they can. They do sometimes become overwhelmed because of this though, not feeling like they can express their own troubles for fear of becoming a burden themselves. ISTPs don’t really seek to unburden people, since they are independent people. They want to focus on their own goals and allow others to do the same. This isn’t because they do not care, ISTPs just don’t believe in stepping in where they haven’t been asked. They are more than happy to help out when someone asks for it and can often find ways to teach people how to take care of these problems and are more than willing to be helpful. ESTPs do sometimes seek to unburden the people closest to them, not wanting to see these people stressed. ESTPs care about their close knit friends and loved ones and they do want to be able to provide for them and make them happy. ESTPs are also independent people and so when it comes to the workplace or other situations they won’t go out of their way to unburden someone unless they ask for the ESTPs help. ISFPs are very independent people who focus on their own emotions and desires. They do care deeply about others but it isn’t natural for them to seek to unburden people. When someone asks the ISFP for help they are often willing to be there for them, they just don’t believe in butting in when they aren’t asked. For the ISFP actively trying to unburden people just isn’t something which makes sense to them, and they often prefer to focus internally. ESFPs don’t really seek to unburden people unless it is someone they are extremely close to. They want to help out their loved ones and be supportive of their needs. At the same time ESFPs are independent people who prefer to focus on their own internal goals and feelings. If they witness someone is struggling they are certainly willing to step in, especially someone they care deeplt for.